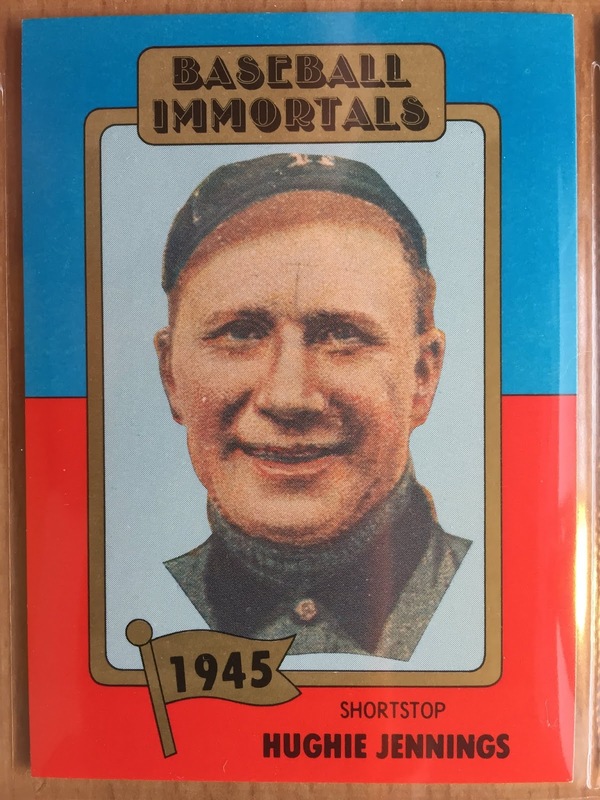 From 1940 through 1944 the only player inducted into Cooperstown was Rogers Hornsby in 1942. 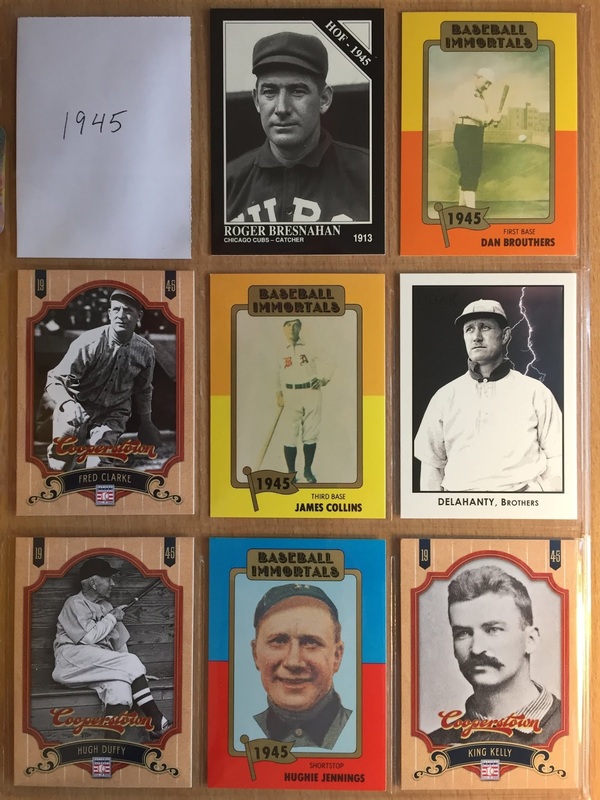 To put that into perspective professional baseball had been around for 60+ years and the Hall of Fame had only enshrined 22 players. The next 60 years would see 190 players. The class from 1945 included nine gentlemen and all but Jim O'Rourke fit on this binder page. This is the one time I wish I wasn't using pockets to mark the election year! Bresnahan became the second catcher to be elected into the HOF, but he is sometimes referenced as one of the more undeserving electees. During his 17 year career he led the league in HBP once and BB once. He batted over 0.300 three times and finished with a career 0.279 average. Also, he played in over 100 games only 8 times during those 17 seasons. Like everyone else on Page 4, Dan Brouthers was elected by the Veteran's Committee. 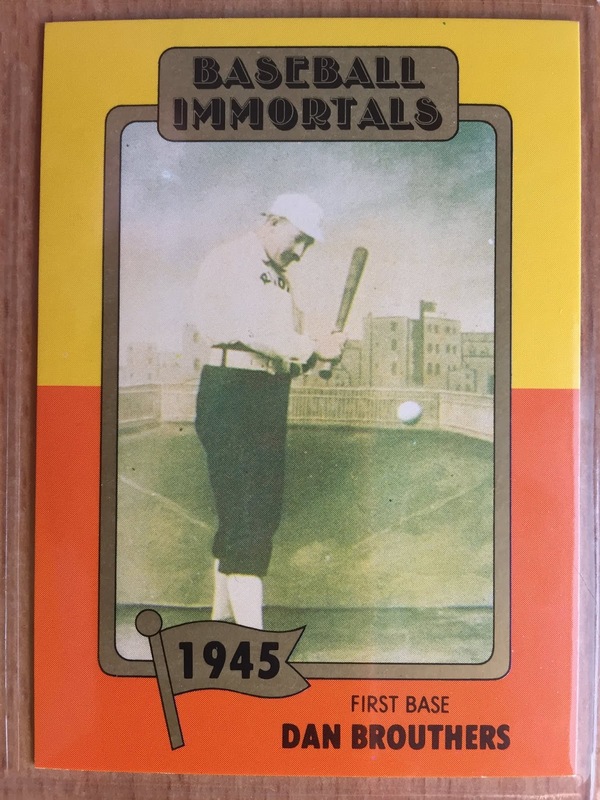 This is my favorite card of the page and it receives that designation because of the coloration along with his focus on the ball in the picture. Brouthers was a pretty solid offensive contributor, as he topped the league in OPS eight different seasons. 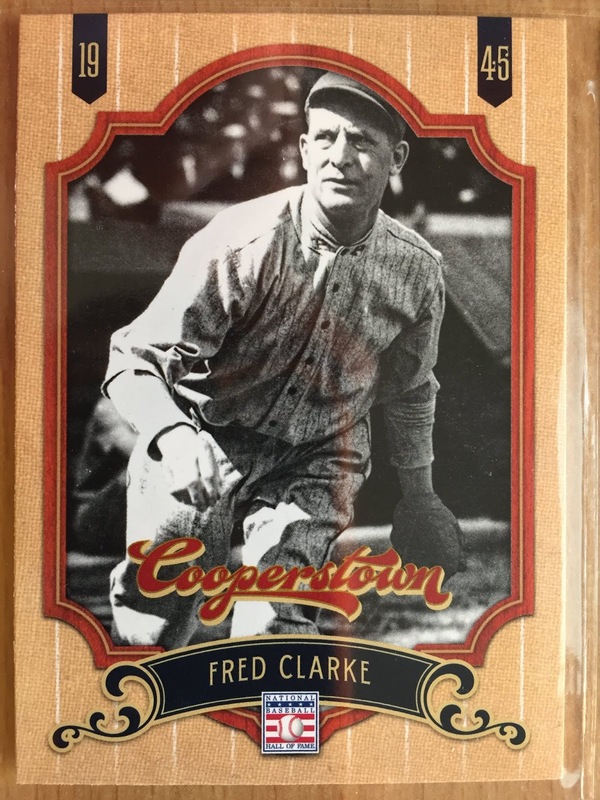 Fred Clarke, and outfielder who hit 0.300+ eleven times, played twenty-one years professionally. 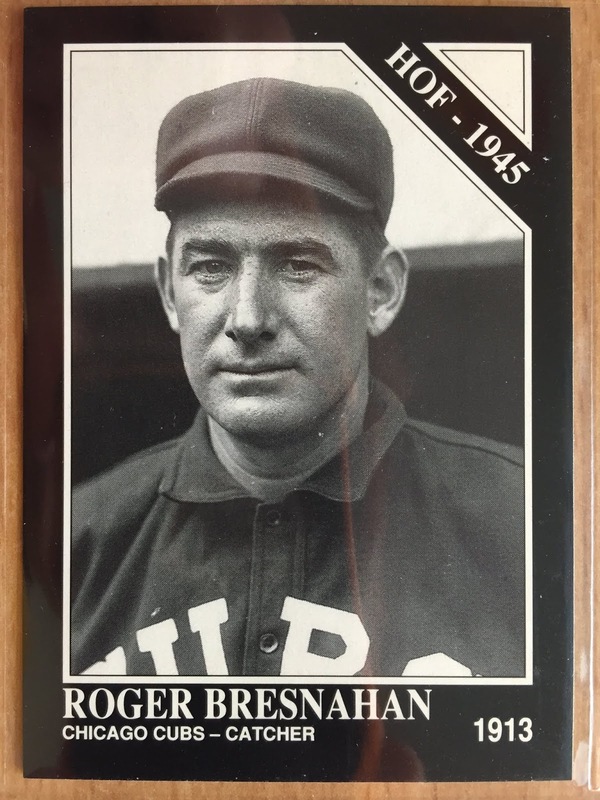 He spent six years playing for the Louisville Colonels and the rest of his career was spent in Pittsburgh. This is a card I'd like to replace. I feel it has too much white on it. Mr. Collins and his white uniform almost bleed into the off-white background. 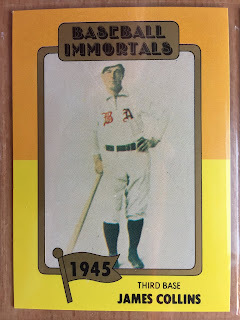 The Hall of Fame doesn't have a ton of third basemen on its player roster, but Jimmy Collins was one of better players in baseball to man the hot corner during the early days of the sport. 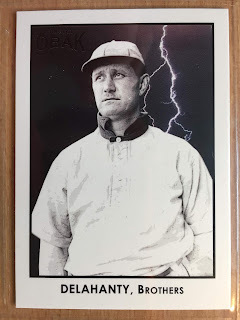 I think "Big Ed" Delahanty is often forgotten during discussions of the game's early superstars. He played 1300+ games in the outfield, but also played 500+ games all over the infield. He was obviously an amazing athlete to have that type of versatility. He topped the league in slugging percentage five times and hit over 0.400 three times. The man could rake. But, he seemed to be also a risk taker. His body was found at the bottom of Niagara Falls when he was 35 years of age. Yikes! For the record, I need to upgrade this card also. I like the lightning in the background, but the card focuses on the Delahanty brothers, not solely on Big Ed. 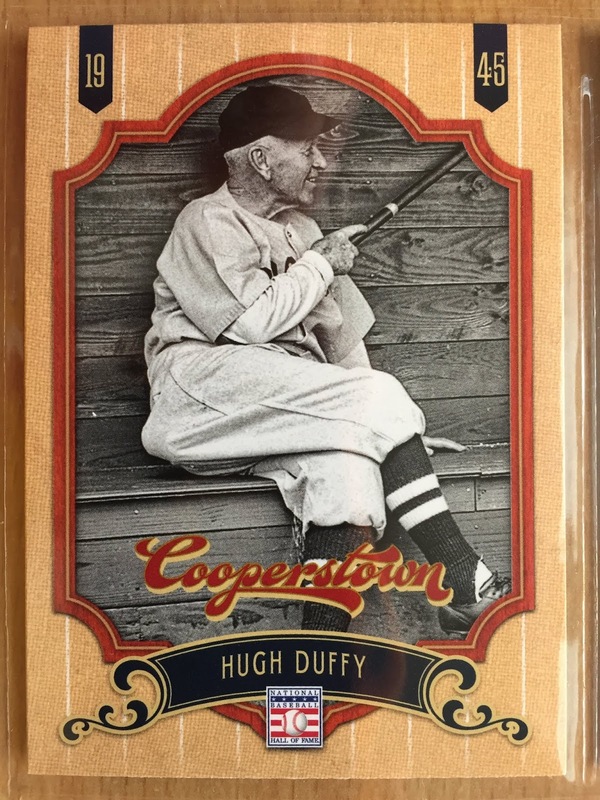 This card shows Duffy from his managing days. He was not a HOF caliber manager. Thus, yep, another upgrade is desired. All you need to know about Duffy from his playing days is what you can find from 1894 season: 160 runs, 51 doubles, 16 triples, 18 homers, 145 RBI, 48 stolen bases, a 0.440 average and 66 walks to 15 strikeouts. 18 homers in the dead ball era? Noticing how he had 500+ career steals I'm thinking many of those home runs were of the in-the-park variety. 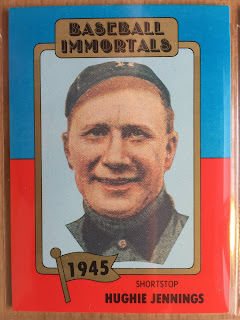 Hughie Jennings, a shortstop, once hit over 0.400, but was probably more known for leading the league in hit-by-pitches five years in a row. During a three year stretched he averaged being hit 48 times a season. Wow! 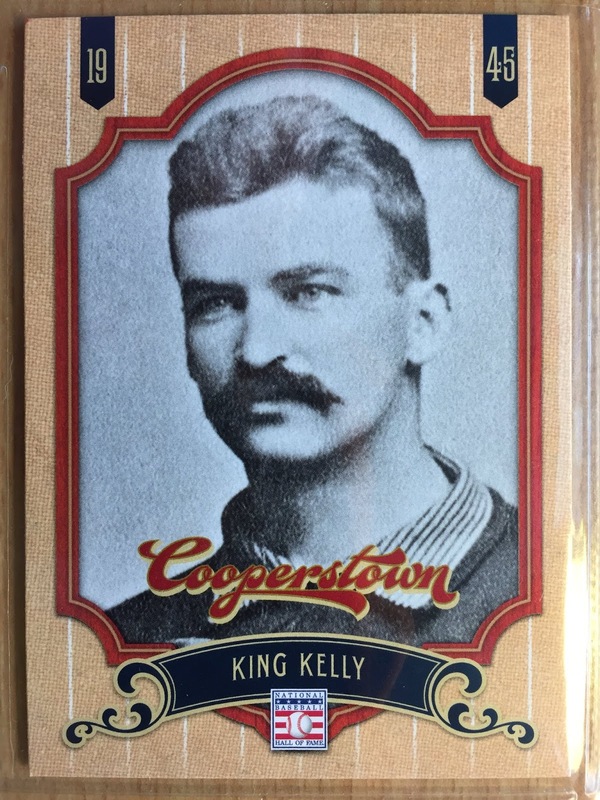 King Kelly was a true jack-of-all-trades type of guy. He played all over the field and could hit. 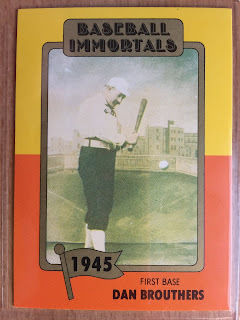 His best year was probably 1886, for the Chicago White Stockings, when he won the batting crown, while playing 50+ games in the outfield and at catcher and at least five games at every other infield position. Plus, that mustache! Overall, this probably my least inspiring page in my binder. The eight names on this page aren't your more common HOF names. When compared to the previous three pages I believe this page needs the most work on upgrading. As I've stated before, I don't care for cards from the same set on the same page and the trio from Panini Cooperstown and TCMA Baseball Immortals needs a trimming. All in good time I suppose! That 1894 season by Duffy is ridiculous! Only 15 strikeouts in a season? Judge and Stanton have had series with comparable numbers. Fred Clarke needs more recognition as being a great in the early years too. That is one HOF class I know zero about. Thanks for enlightening! Although I recognize many of these guys' names... I gotta admit I didn't know that they were all HOFers. Love this series though. I learn something every time. Loving this Blog series / collection! The Dan Brouthers pic is from one of his 1887 Old Judge cards (there were 3 different poses). Those Panini sets are pretty good for including HOF players that go un-celebrated. Probably so many more great players from that era we'll never know because of that low induction rate. 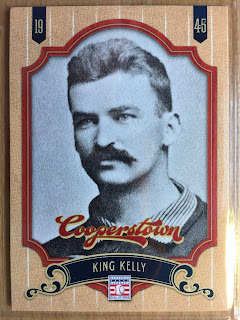 Definitely an obscure HOF class here (if such a thing exists), but I do remember reading once that King Kelly once single-handedly changed the rules of baseball. Back in Kelly's era, there were no real rules regarding substitutions or how they were made. One day, while Kelly was on the bench, an opposing batter hit a pop fly near the dugout. He jumped up, ran onto the field, said "Kelly now catching for Boston!" and caught the ball. Given the loophole in the rules, the ump had no choice but to declare the batter out and Kelly in the game. Great story, Nick. Thanks for sharing! one of those pitches nearly killed old Hughie! love these posts, Tom!